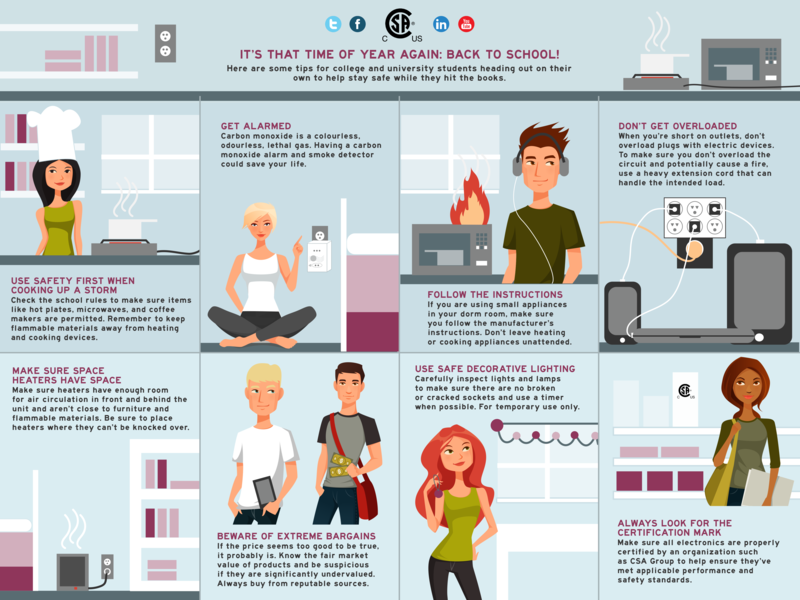 The first day of school is around the corner and CSA Group, a leading standards development organization, and global provider of testing and certification services, is offering some important safety tips for college and university students moving out on their own. When heading out on your own for the first time it’s tempting to bring the comforts of home with you. Your dorm room may not be designed for a gourmet kitchen, so before you arrive it’s important to check with your school to see what appliances you can bring and what needs to stay at home. Following these tips for your electrical items can help to make sure they are used safely and help you avoid accidents and injuries. Fully stocked: Some residences don’t allow cooking devices or appliances to be used in your dorm room. Check the rules at your school to make sure the items you plan to have in your room are permitted. Make your mark: Be careful when trying to save money shopping at discount stores. When a product or packaging doesn’t include a brand identifier, trademark, or company address, it may be a counterfeit which can lead to serious safety issues. Brand-name companies want you to know whose product you’re buying. Look for a certification mark on your electronics, to help ensure they’ve met applicable performance and safety standards. Sound the alarm: Carbon monoxide is a colourless, odourless, lethal gas and a carbon monoxide detector could save your life. Make sure you have a working carbon monoxide alarm and smoke detector installed in your room. Check for a certification mark from a recognized organization, like CSA Group, to help ensure it’s been tested to the applicable standards for safety and performance. Note it: If you are using small appliances, like microwaves, coffee makers or hot plates in your dorm room, make sure you follow the manufacturer’s instructions. Don’t leave items unattended while in use and keep flammable materials away from cooking and heating devices. Lighten the load: When you’re short on outlets, it may be tempting to have your laptop, gaming system, sound system and microwave all plugged into one cord, but that can overload the circuit and potentially cause a fire. Make sure the extension cord is heavy enough for the intended load. If a cord or plug becomes hot when it is plugged in, it may be overloaded. Semi-permanent installations should not use extension cords. Hot stuff: Space heaters are a great way to heat a chilly room, but are not meant to dry clothes, heat food or warm your bed. Misuse can lead to serious injuries, fatalities or fires. Place the heater where it cannot be knocked over, at least one metre from furniture and flammable materials such as curtains, bedding and paper. Always follow the manufacturer’s instructions and look for a certification mark from an accredited organization, such as CSA Group. Look it up: To confirm CSA Group certification of a product, compare the product’s identification against the certification record in the Certified Product Listing. For more everyday consumer tips, safety tip videos and safety advice, please visit www.csagroup.org.